Take a tour through the mid-career survey of Owens' work, which carries her spirit of contradiction. Sometimes a painting must be viewed at a certain angle for the image to resolve. A blot becomes a skull; a ceiling becomes a dome. Like anamorphosis, the artwork of Laura Owens must be experienced in the original. There is much context one can consider— or dismiss— when doing so at the Dallas Museum of Art. 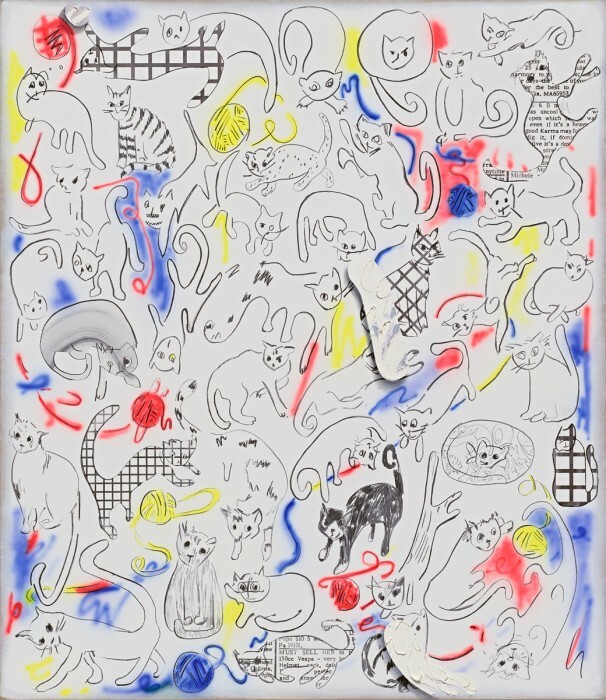 The mid-career survey exhibition by Laura Owens arrived to Dallas from the Whitney Museum of American Art in New York. That stop drew protest from community advocates based in Boyle Heights, Los Angeles, where Owens and her gallerist Gavin Brown opened a space that helped catalyze gentrification and displacement in the area. At the DMA, Owens’ show is a hallmark of their 2018 program known informally as “the year of the woman”, dedicated to highlighting the work of significant women artists from the 18th century onwards. This initiative was being announced just as senior curator Gavin Delahunty resigned due to “inappropriate behavior” and apologized, with no further comment from the museum. A painting is a flat object on the wall. Born in 1970, Laura Owens is not infrequently referred to as one of the most influential artists of her generation. Dead since 1973, Pablo Picasso is not uncommonly acknowledged as one of the most influential artists of a generation or three ago. Whatever one’s attitude towards the famous Spaniard, the man came up not only with innovative approaches to traditional media but also a pertinent phrase, trompe l’espirit — a trick of the mind. A level of perception above trompe l’oeil effects that invite the viewer to delight in acknowledging the treachery of images— Ceci n’est pas une pipe— trompe l’espirit seeks instead to bodily transport the audience into another world, by the sheer force of aggressively extraverted existence. Laura Owens’ most viscerally engaging work exemplifies nothing less than painting in the fourth dimension. A curious visitor strides into an art gallery and instantly runs into a life size painting of an art gallery. Peculiar, but hardly unprecedented: art collections have been visually documented for about as long as collecting existed, and Ancient Rome itself is famous for the forced perspective in its frescos of false gardens and rooms. Sagely nodding, the visitor turns to the side and does a double-take. Another painting on a nearby wall forms series with one hanging in the pretend gallery. The painted world spills out from canvas into reality and pours its way back in like a museum adaptation of Who Framed Roger Rabbit. But then the visitor spins widdershins and shrinks to an insect on a vast boarded plain, looking up towards a potpourri of dozens of distinct artworks crowding a green gallery wall in the distance. One those frames depicts an ant’s view of a green-walled art show. Curiouser and curiouser. How much further beyond physical paint does this progression of paintings within a painting extend, and where does the visitor fit in with all of that? The visitor shakes her head and steps hastily away, noticing an unassuming canvas a couple of feet in the periphery. It shows another upside-down motif the visitor has just observed among the green gallery’s paintings. So whose dream was it anyway? How many animals can fit into one forest landscape? What about if we make them really, really small? In a refracted echo of the stillness in René Magritte’s The Empire of Light, this land teems with vibrant life, and the sky has opened amidst the midday clouds, and the night descended upon a cross-eyed owl (Owens, 2002). Academia remains firmly against wholesale digitisation of artworks. Meanwhile, Laura Owens sidesteps the trouble and hand-paints a world of digital manipulation with crisply sharpened shapes against thick defocus blur. There are unapologetic drop shadows, newspaper collages, and sweeping zoom-ins. At one of Laura Owens’s pervious exhibitions, guests could in fact text a painting and receive a vocal reply right out of the wall. And speaking of texting, while the increasingly popular digital media squabbles with its venerable analogue counterpart over its place in the cozily inhospitable Art World, anyone with an iPhone may now decorate their opinions on this and other critical issues with sculptural emoji by Laura Owens, freely available as an iMessage pack. In this age when making a quick copy of virtually anything requires little effort, plagiarism is condemned as never before. Battle lines between fair use and copyright violation, deferential tribute and villainous appropriation are passionately drawn and redrawn in continuity. Crosswise to the chaotic clash of interests, Laura Owens repaints in lurid blue one of Toulouse-Lautrec’s iconic drawings: Le lit, dating 1893. Is this determinedly untitled version by Laura Owens a kind of fan art, a study, a remix, a commentary, or a forgery? The verdict is up to the audience, but the overall message rings out a familiar tune: why couldn’t this be valuable art, too? Like a magpie with a mission, Laura Owens collects the work of fellow artists past and present, drawings of her friends and family, music and lyrics, the digital and the analogue, paint, embroidery, felt tip pens, newspaper, pebbles, buttons, golden ink — at times, all in a single artwork. If it feels right and serves a purpose, then why the hell not? Slyly smirking jungle predators should keep to nursery books, and swashbuckling pirates to teenage adventure novels. 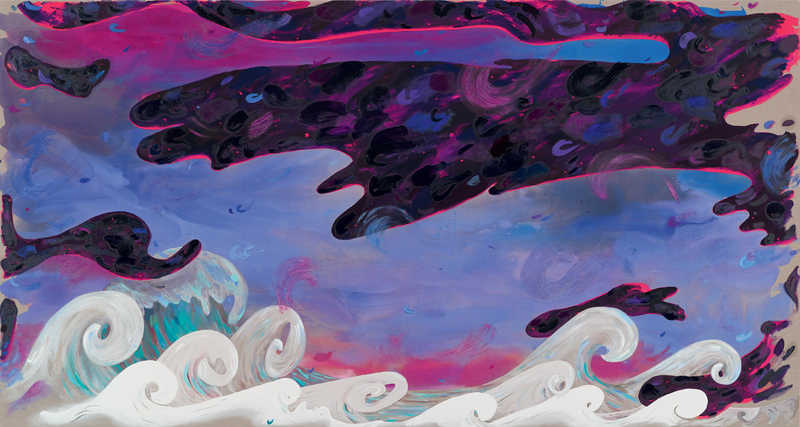 Nonetheless, both are well-represented in Laura Owens’s survey exhibition. To add insult to injury, a series of 33 square canvases with a colourful rendition of the English alphabet is embroidered rather than strictly painted, and a wall-full of massive abstractions does not shy away from liberal application of hot pink. California indie rock band Pavement, reasonably prolific throughout the 90s, made music sadly unsuitable for karaoke. Fortunately, it suited Laura Owens just fine to inspire seven impressively large, defiantly pink, deceptively multilayered paintings full of grids and blotches and typography. The DMA show features only five of them, but the giant lettering across the series spells out: “Pavement Karaoke.” One small injustice in the world is corrected. A little Business 101. Customers like to be given choices. This offers them a soothing illusion of retaining a modicum of control in the world of merciless, omnipotent market. As a true and trusted method to promote this illusion on the cheap, companies manufacture many copies of the same product in a good number of superficially different colour schemes. The satisfied customer is then empowered to pick a painting to match the room, a bench to match the mood, and a book to match the coffee table. And in a way, Laura Owens has got each base covered. Consider, for example, the infinite furniture showroom. In tandem with Cuban-American sculptor Jorge Pardo, who was her boyfriend at the time he designed the given series of modular bedroom sets, Laura Owens created several nearly identical paintings where bees buzz around, orangely cross-pollinating field flowers. Does the slightly more-green one look better, or is it the brown? After the initial show, at least two of the sets were successfully installed in residences and lived out their full pragmatic potential, up until someone decided to throw an exhibition and relegate the unhappy owners to the couch. The beds and the bees multiply in a panopticon of vanity mirrors around the showroom, reflecting more showrooms, on and on, without end. Laura Owens, an enthusiastic collaborator, artist, designer, and a prolific publisher of artist’s books, released an untitled exhibition catalogue for the mid-career survey show now hosted by the DMA. In its span of more than 600 heavy pages, an intimate and confounding backstory of art weaves in and out of margin notes, photographs, letters, reproductions, zoom-ins and collages, patterns and icons, all organized with the rationale of a treasured scrapbook. From the cover to the least section of a page, this catalogue is never bookish or dull — but best of all, each volume sports a unique cover. So necessarily, one is destined to fit the shelf of even the most exacting of art consumers perfectly. A minor yet far from insignificant portion of the Laura Owens exhibition boasts free admittance in the public DMA galleries, while the main show is on view in the Hoffmann Galleries of DMA until July 29, 2018.